In 1999, my book Mysteries of Planet Earth became the first cryptozoologically-oriented book to include a specific section on what must surely be one of the most strikingly beautiful mystery beasts ever reported, and its coverage was greatly enhanced by the inclusion of a spectacular full-colour painting of this animal - another first for it - prepared specially for my book by renowned cryptozoological artist William M. Rebsamen (and which also opens this present ShukerNature blog article). Neither of us realised at that time, however, that only a few years later I would actually witness just such an animal, and in a wholly unexpected manner. The following article – the most detailed that I have ever prepared on this particular subject and constituting a ShukerNature exclusive – contains not only all of the information that I included in my 1999 book but also various additional cases uncovered by me since then, including my own afore-mentioned observation. So where better to begin it than with that observation – and here it is. On 20 July 2005, I was sitting in front of the television at home in the UK, flicking idly between channels, when I happened to click onto Channel 5, and within a few seconds beheld an extraordinary sight. The programme being screened was a documentary entitled 'Whale Shark: Journey of the Biggest Fish in the World'. However, the fish that I was staring at in amazement was anything but a whale shark. It was a giant manta ray Manta birostris - a huge, superficially nightmarish beast popularly dubbed a devil-fish (see also here) due to its mouth's pair of demonic, horn-resembling, laterally-sited cephalic fins, and its huge batwing-like pectoral fins, uniformly dark on top, white below...except that this particular manta's pectorals were most definitely not uniformly dark on top. Instead, they were dramatically adorned by a longitudinal series of white v-shaped chevrons, and also sported pure white wing tips. This spectacular vision soared gracefully through its underwater domain for a few moments before the camera moved on to other subaqueous delights, and it did not appear again. Not having tuned in to this programme from the beginning, I had no idea where the striped manta had been filmed, but the very next section of the documentary stated that the whale shark star of the show had now reached the Mozambique Channel, apparently having travelled there from the Seychelles region of the Indian Ocean. So this may have been where the manta footage had been shot. What made this serendipitous sighting so notable was that for a great many years (right up to the time when I viewed the above-cited TV programme, in fact), mainstream zoology had tended not to recognise the existence of mantas other than the mundanely standard dark-dorsal, pale-ventral version. Yet there on screen was positive proof that at least one manta of a decidedly more flamboyant variety was indeed real. Nor was it unique. Several other specimens have been documented down through the decades, exhibiting a range of patterns, and spied in many different oceanic localities. From tip to tip of wings it was at least ten feet, of somewhat the usual manta or devil-fish shape, except that the wings were not noticeably concave behind, and the lateral angles were not acute. The cephalic horn-like structures were conspicuous and more straight than incurved. In general the back was dark brown, faintly mottled, while the most conspicuous character was a pair of broad, pure white bands extending halfway down the back from each side of the head. The wing tips also shaded abruptly into pure white. 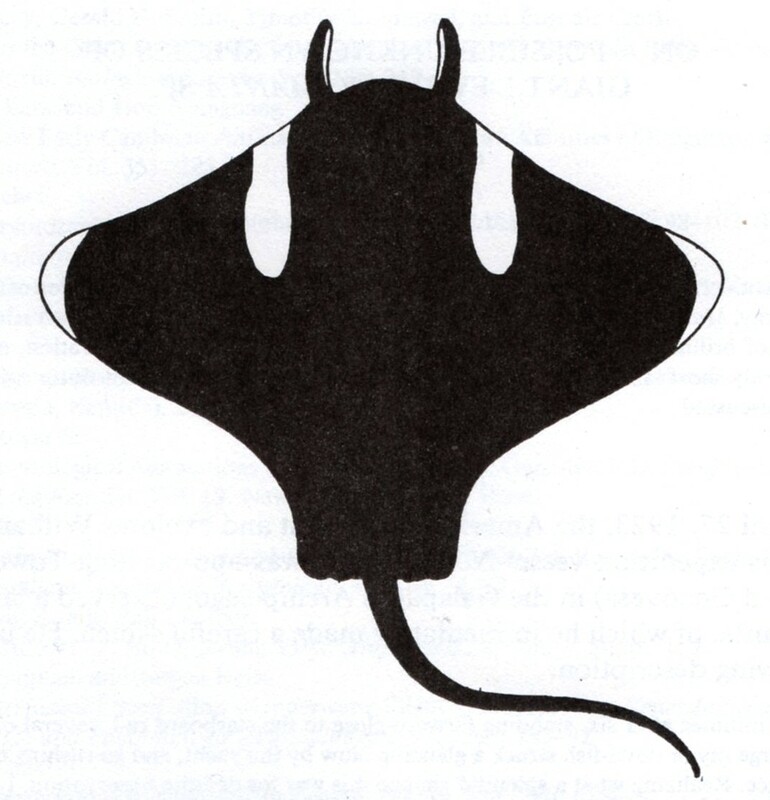 Documenting this dorsally-bicoloured manta in his book Galapagos: World's End (1924), Beebe considered that it may represent an unknown species. In Vol. 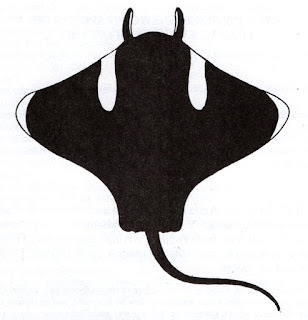 12 of the now-defunct International Society of Cryptozoology's scientific journal Cryptozoology (covering the period 1993-1996), German researcher Gunter G. Sehm's paper on striped manta rays surveyed some other specimens. In 1924, fr example, a small manta was harpooned off the shore reef at Kiribati's Fanning Island (renamed Tabuaeran). Its dorsal surface was blue-black but also bore two large ash-coloured v-shaped chevrons that spanned the entire dorsum from left pectoral edge to right. In 1934 this specimen was deemed a new species and dubbed Manta fowleri, but its separate taxonomic status is no longer recognised. In 1975, British Museum ichthyologist Alwyne Wheeler's book Fishes of the World contained a colour photograph of a manta ray that appeared to have some white striping on its right shoulder, although few details can be discerned because the picture had been taken side-on. A year later, a book by Pierre Fourmanoir and Pierre Laboute detailing the fishes native to the waters around New Caledonia and the New Hebrides included a colour photo of a manta ornately adorned with dorsal white banding and cephalic fins. In his paper, Sehm also included three hitherto-unpublished stills from a 30-second footage of film showing a manta with a pair of striking, laterally-sited, v-shaped dorsal markings, filmed off the coast of Mexico's Baja California by Sigurd Tesche, which had been broadcast by German TV on 28 December 1989 within a programme entitled 'Sharks: Hunters of the Seas'. Correspondent Alan Pringle contacted me shortly after watching, on 7 November 1999, a BBC1 television programme 'Holiday Guide to Australia', to inform me that it had contained a snippet of film depicting a manta with two converging longitudinal dorsal white bands, filmed from above by a helicopter, as it swam above a reef in Australia's Great Barrier Reef. I learnt from fellow crypto-enthusiast Matt Bille that on 19 September 2003, yet another striped manta made an unexpected television appearance, this time in the American reality game show 'Survivor', when a manta ray sporting a very prominent pair of white shoulder markings, resembling filled-in triangles along the body, cruised fleetingly just under the clear waters off Panama's Pacific coast. Not long after my own television sighting in July 2005, I was informed of two separate webpages each containing a colour photograph of a striped manta. 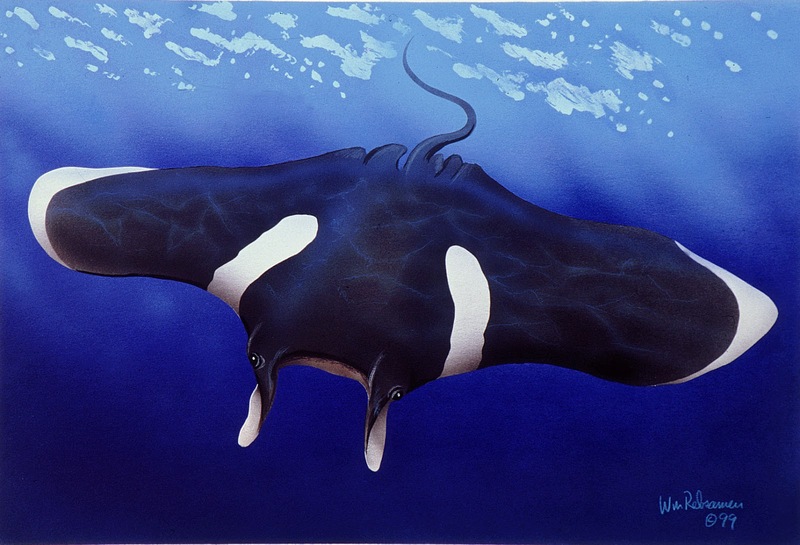 One of these, which still appears here, shows a manta with symmetrical lateral chevrons resembling those of the Baja California individual, but it also has white rings around its cephalic fins, a pale patch at the dorsal tip of its left pectoral fin (its right cannot be seen dorsally), and what looks like a white dorsal tail surface. More photos of it have since appeared on Wikipedia and elsewhere online, confirming that it does have a white patch at the dorsal tip of its right pectoral fin too. It was photographed at Hin Daeng, off Thailand. The other page (no longer directly online at http://www.accessnoaa.noaa.gov/images/monitor1.jpg but still accessible here - thanks to the Wayback Machine Internet Archive) – in a website run by America's National Oceanic and Atmospheric Administration (NOAA) - showed an ornately-marked specimen with very extensive white wing tips linked posteriorly by a pair of white converging arcs, as well as white cephalic fins. No details of where this photo was taken were given. In short, a diverse spectrum of striped mantas is on record, with no two alike, but collectively confirming that dorsally bicoloured individuals do indeed exist. So how can they be explained? 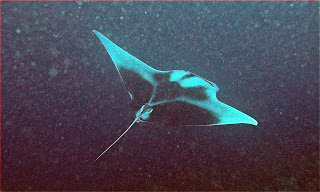 Interestingly, some of them, notably Beebe's specimen, the Fanning Island manta, and the Baja California example, have conspicuously shorter-than-typical tails, and also the shape of their pectorals do not exhibit such marked convexity of the front edge and concavity of the trailing edge as those of 'normal' mantas do, leading Sehm to consider the possibility that these represent a separate taxonomic form. Equally, however, sometimes genes linked to colour or body pattern also influence the size or shape of an individual (pleiotropic genes), so there is no guarantee that these morphological differences have independent significance. 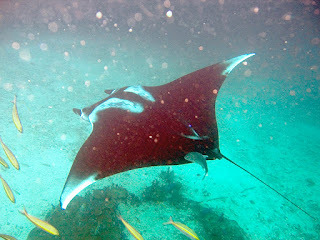 Moreover, it is known that attacks by other fishes can leave white marks on the dark dorsal surface of a manta. In fact, its dark pigment can even be removed merely by rubbing the surface, creating pale patches. 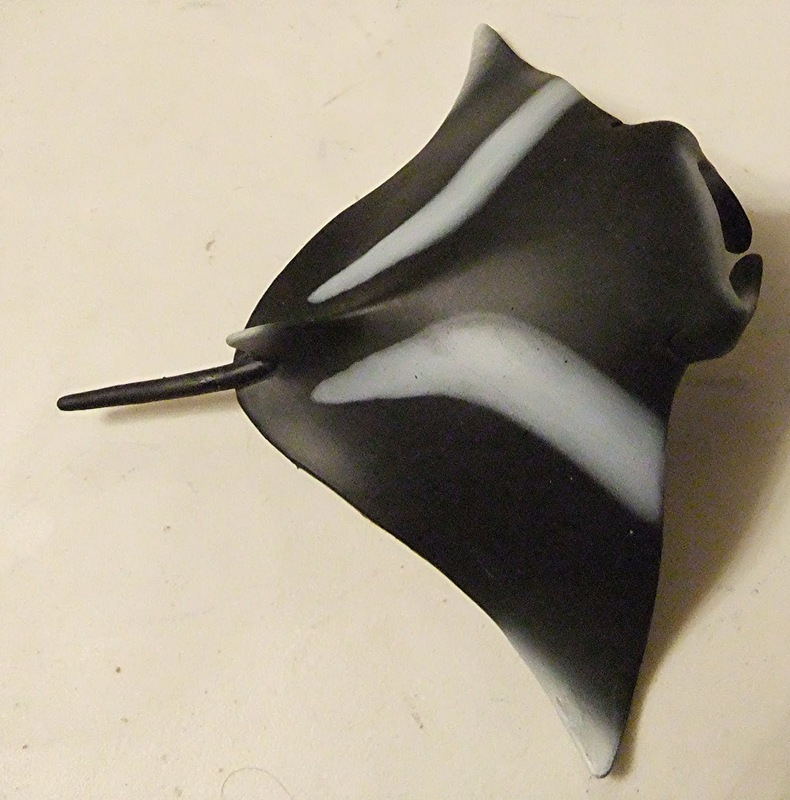 And the elasmodiver website's manta page states that the wing tips often fade to white. 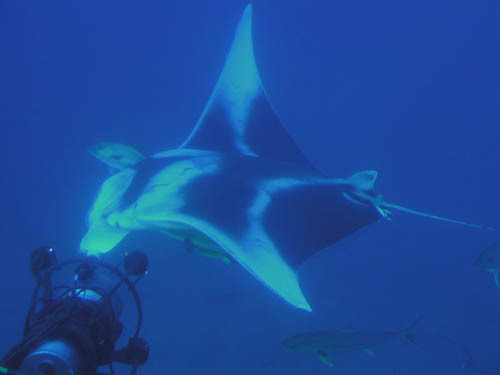 Worth noting, incidentally, is that back in the early 2000s this latter site was one of the very few mainstream sources that openly acknowledged the existence of striped mantas, stating at that time: "Dorsum black or dark often with symmetrical white patches forming a chevron across the shoulders". Intriguingly, Sehm attempted to explain away the white wing tips of Beebe's specimen as an illusion, claiming that what Beebe and his colleagues saw was the white undersurface of the wing tips upraised, fooling the observers into thinking that the dorsal wing tips were white. However, I do not believe this interpretation - the NOAA website's manta unequivocally possesses white dorsal wing tips, as did the specimen that I watched in the whale shark film. Instead, judging from the elasmodiver website's comments, it may be that white-tipped mantas are aged specimens. However, so precise is the symmetry of the white markings on all specimens of striped manta, whether they be wing tip markings, shoulder markings, or chevrons, that this seems unlikely - as do, for the same reason, explanations invoking injury or rubbing as the source of such markings. In 2005, within a Fortean Times article of mine devoted to these mystery mantas, I expressed the view is that a mutant gene allele was most probably responsible, engendering on rare occasions these stunning and sometimes quite elaborate patterns in mantas - analogous, perhaps, to black-and-white specimens of blackbirds, black bears, crows, and other normally monochromatic species, and creating an additional vision of wonder and mystery amid the breathtaking splendour present beneath the surface of our planet's mighty seas. Sure enough, thanks to observations and photographs taken of many additional specimens since then, the existence of striped manta specimens is nowadays not only universally accepted among ichthyologists but also, far from constituting a separate species, is deemed to be nothing more than an expression of individual non-taxonomic variation within the long-recognised giant manta species Manta birostris. Unrelated to such considerations but still worth noting, however, is that in 2009, a second, somewhat smaller, and non-migratory manta ray species, the reef manta M. alfredi, was officially distinguished, named, and formally described – see my Encyclopaedia of New and Rediscovered Animals, 2012, for more details. But this is not all. In autumn 2014, a mainstream ichthyological discovery was made public via a scientific paper that revealed an exceedingly significant but hitherto entirely unsuspected aspect concerning the true nature of striped mantas. Ironically, however, this crucial find has attracted relatively little attention, especially in cryptozoological circles. Indeed, as far as I am aware, the following documentation of it by me is the first time that this remarkable discovery has ever been referred to in such a capacity, even though it holds the key to these distinctive fishes' very existence. Published by the Biological Journal of the Linnean Society on 1 September 2014, the paper in question (click here to read it in its entirety) was authored by Csilla Ari, from the University of South Florida's Hyperbaric Biomedical Research Laboratory, and revealed for the very first time that giant manta rays possess the ability to change colour and pattern at will. 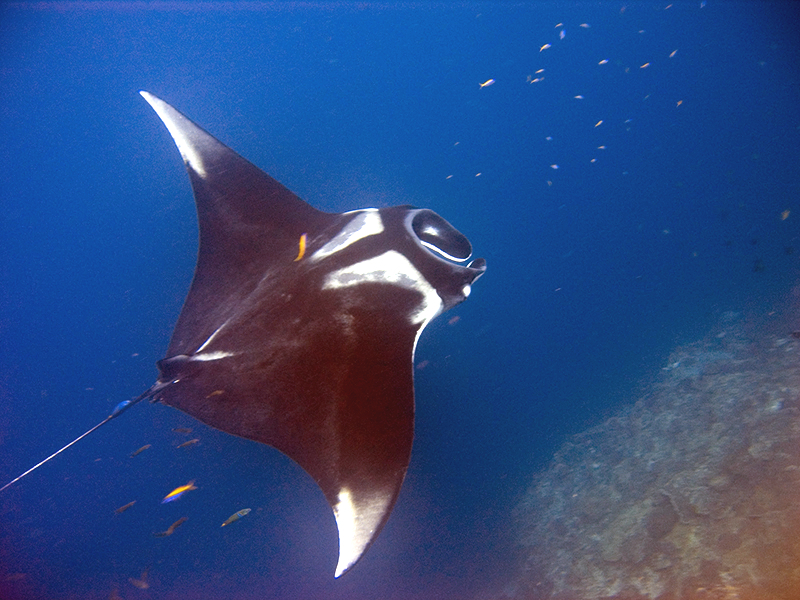 Ari's study showed that a manta's typical (or, as termed in the study, its baseline) colouration state (i.e. 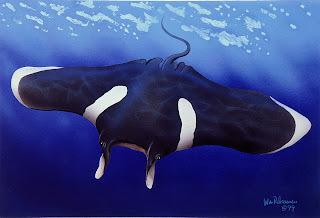 its dark dorsal surface) can change rapidly at feeding times, or if it encounters another manta ray in close proximity to itself, or during intense social interaction between itself and another manta ray. And the precise nature of this colour change is a very noticeable increase in the brightness of hitherto pale, inconspicuous shoulder and pectoral wing tip markings. In other words, when faced with any of the situations listed above, a typical dorsally-dark manta can transform directly into a striped manta! Captive manta rays were observed to undergo rapid changes (within a few minutes) in their body coloration. Specifically, white markings appeared and changed intensity on certain body regions (Fig. 1, 2, 3, 4; the two most representative specimens from each species are shown). The intensity of the white markings would increase rapidly to the ‘intense coloration state’ (Fig. 1D, E, F, G, H, 2D, E, F) more times during the day within a few minutes, and then return to the normal ‘baseline coloration state’. Changes in coloration were observed to occur in temporal proximity to a variety of situations, including at feeding times (Fig. 1H), whenever a new manta ray was introduced to the tank, and during intense social interaction between the two manta rays (Fig. 1G). Feeding occurred twice a day and the rapid coloration changes started shortly (5–10 min) before each feeding on both specimens. The ‘intense coloration state’ was most intense during feeding and slowly returned to the ‘baseline coloration state’ over a period of 20–30 min after the end of the feedings. In addition, rapid coloration changes were observed in association with intense social interaction; for example, when Manta 2 was introduced into the tank or when mantas were chasing each other rapidly and closely, which appeared to comprise courtship behaviour. The mystery of the striped mantas is a mystery no longer. True, there may be occasional specimens that do exhibit such markings on a permanent basis as an expression of individual non-taxonomic variation, but in most cases such markings would seem to be merely a temporary feature, induced on a non-permanent basis by various fluctuating external stimuli. Finally: even though we now know the secret of the striped mantas, it is still thrilling when one of these spectacular creatures turns up unexpectedly – and that is precisely what happened to me a second time just last night. I had been watching the 2016 Disney cartoon film Moana, whose storyline was inspired by traditional Polynesian mythology and featured the famous demi-god Maui, when suddenly, in a split-second segment right at the end of the film, an animated striped manta sporting a vivid pair of white shoulder bars and pectoral wing tips soared majestically through the water just beneath the surface. A fitting finale, assuredly, for a movie of magic and mythology to feature a maritime denizen so long associated with mystery and mystification.